The Tooele County Project is part of the UTGenWeb Project, both are part of the USGenWeb Project. We are a group of volunteers working together to provide free access to genealogical materials for researchers. These projects combined cover every county in every state in the United States, we are non-commercial and fully committed to free access to genealogical materials for everyone. The Tooele County Courthouse and City Hall (pictured above) is located at 71 E Vine Street in Tooele, UT. It was built by Isaac Lee in 1867 in a Greek Revival style architecture and has been on the National Register of Historic Places since 1983. 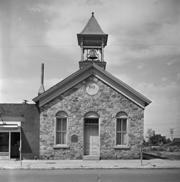 The building had served as courthouse and city hall from 1867 - 1899, and as city hall until 1944. Tooele County is one of the original counties in Utah. It was organized in 1852 and at one time included part of western Nevada. Tooele County is bordered on the north by Box Elder, to the west by the state of Nevada, Juab County to the south, and Davis, Salt Lake (alternate Salt Lake site) and Utah counties to the east. LINK DISCLAIMER "Links to web sites that are not part of the USGenWeb Project are provided for your convenience and do not imply any endorsement of the web sites or their contents by The USGenWeb Project." Copyright © Tooele County Coordinators for the UTGenWeb Project. Design by CSS Templates For Free.